In 1994 there is a civil war in Burundi, a small country of Central Africa directly bordering Rwanda. 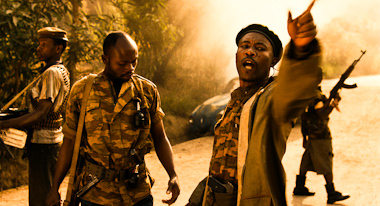 Na Wewe (pronounced “Na wayway”) means “you too” in Kirundi and the film relates a sadly frequent episode of the fratricidal conflict between Hutus and Tutsis: the attack by rebels on a minivan carrying ordinary citizens. As the passengers are sorted with an order “Hutus to the left, Tutsis to the right,” the question becomes who is a Hutu and who is a Tutsi. This story is entirely based on real people and situations, and was written by a person who has lived in the beauty of Burundi and suffered its horrors. With emotion, suspense and humour, it exposes the absurdity of ethnic and racial strife. Nominated for an Oscar.